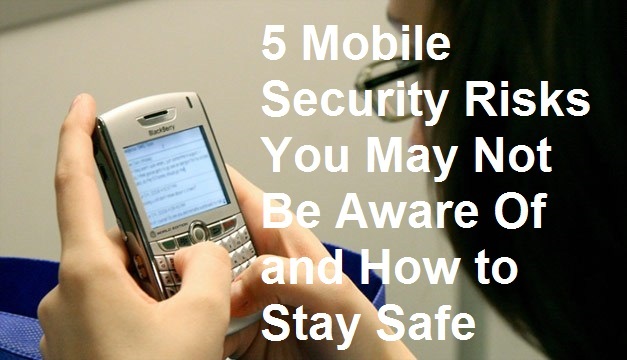 Mobile security risks are on the rise as we all migrate towards using smartphones and tablets. We should be aware of the risks involved with using a smartphone. We should also learn how to protect ourselves from such risks. Mobile devices are prone to attacks because most of us do not take mobile security seriously. Most smartphone users do not use the mobile security features in their mobile devices, so many of us do not even care about installing any additional mobile security software to enhance our device’s security further. As a smartphone user, you are faced with so many mobile security risks and the only way to be safe is by being aware of them and taking the necessary precautions to protecting your device, yourself and your family in the process. So read this article carefully to identify the mobile security risks you may be facing and how you can keep yourself safe from it. 1. Malicious apps: The rate of malware growth in mobile apps these days is alarming, malicious apps can steal your sensitive private data and create a backdoor for hackers on your mobile leaving your device vulnerable to attacks. Malicious apps is one of the mobile security risks everyone of us should be aware of and how to protect ourselves from such threats. The best way to stay safe from this type of mobile security risk is NEVER install apps that are not from the Google Play Store or Apple Store etc. Do not install third party apps without scanning them with an up-to-date antivirus. 2. Geotagging in pictures: Geotagging in pictures can be a wonderful feature for a smartphone as it allows you to locate past memories in a few clicks but could also pose a security risk for you. Pictures taken with a geotagging feature enabled mobile device stores data such as date and time when a picture was taken, description of the photo, copyright information of the photo and most importantly the location (longitude and latitude) where the picture was taken. Criminals can now use the information extracted from the pictures to locate and track the whereabouts of their potential victims. Stalkers can simply locate your house; kidnappers can locate your kid’s schools or playground etc. Though social media sites like Facebook and Twitter are beginning to strip pictures of their Exif metadata which stores all these information. To stay safe from this type of mobile security risk, always turn off the geotagging feature of your smartphone camera before taking any photos. Only share your photos with close relatives and friends you can trust. Set your social network privacy settings to personal and only allow trusted folks access to your profile. 3. Wi-Fi Network (without encryption is unsafe): Data transfer via a Wi-Fi network without encryption posses a security risk and you should be aware of it so as to protect yourself from such risk. Wireless transmissions are not always encrypted, so when you send emails or use your applications via a Wi-Fi network you maybe endangering yourself even without knowing. Your data can be intercepted. To stay safe from this type of mobile security risk, ensure to prevent your apps from transmitting data via Wi-Fi; avoid sending emails via a Wi-Fi network except its encrypted. 4. Out-of-date Apps may pose a risk: The mobile apps we installed on our smartphones can pose a risk especially when it has been out of date. Out-of-date apps leave your mobile device vulnerable to attacks as attackers can now exploit such vulnerabilities to attack your device. This is one of the security risks most of us are not even aware of. To stay safe from this type of mobile security risk, ensure you always check for updates of your apps and immediately update any app that has an update release. When app doesn’t get an update for a long time, consider uninstalling such app. 5. Rooting or Jailbreaking may pose a risk: Unauthorized modification of your mobile device such as rooting or jailbreaking changes how the security of that device is managed and this is a security risk we should be aware of. While you may gain a super user privilege to your device and modify the operating system as you want, this act also exposes your device to a great security risk because you may be violating or bypassing the correct application vetting process as designed y the manufacturer and leave your device with less protection against inadvertently installing malware. To stay safe from this type of mobile security risk, avoid any unauthorized modification of your mobile device; keep to the standard of the manufacturer. Conclusion: We are the first line of defense to these mobile security risks as our actions can leave us vulnerable to attacks. So to stay safe from any form of mobile security risks, ensure to keep to the original standard of the manufacturer and also ensure only the best practices/acts that will keep your device, yourself and your family safe. Thanks Shamim for your contribution. hi nwosu. how can i determine whether the wifi in a public area such as malls are encrypted? i only just connect through wifi but i have no idea about encryption. Every Wi-Fi network that requires a key to gain access into it is encrypted. Unencrypted wi-fi networks does not require a key. Thanks Aris for your contribution. I never thought that Geo Tagging feature can lead to such problems ..I never knew of the exif metadata and i would be reading more articles on it .Thanks for making us aware of these risks ! Yea images store informatio as exif metadata and this can provide criminals with information to stalking or carrying out crimes.